If you have ever had the misfortune of experiencing dizziness or vertigo, you probably have a good understanding of how disabling these conditions can be. Many times seemingly insignificant movements or changes in position cause the whole room to begin spinning around you, make you feel light-headed, or give you the illusion you are falling. Fortunately in cases of vertigo, as suddenly as the spinning begins it also stops, generally lasting only 30-60 seconds. Unfortunately, many times, the movement that provoked symptoms will continue to do so unless proper diagnosis is made and treatment is sought. The aim of the following article is to give you a basic understanding of benign paroxysmal positional vertigo (BPPV), what causes it, and basic treatment strategies. To keep this article a reasonable length, dizziness will be discussed in a future blog post. The most common type of vertigo we treat in physical therapy is benign paroxysmal positional vertigo or BPPV. This condition arises due to dysfunction in the vestibular apparatus, which is located in the inner ear. This organ has two main functions: (1) to determine the body’s position with respect to gravity and (2) to determine if the body is moving or accelerating. 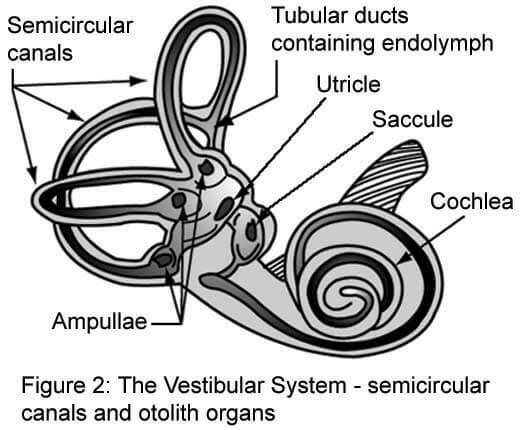 These two different functions are handled by two separate parts of the vestibular apparatus: the otolith organs (utricle and saccule) and the three semicircular canals. 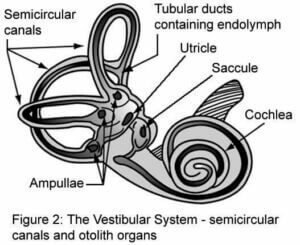 The utricle and saccule are the part of the vestibular apparatus responsible for determining the body’s position with respect to gravity. They are able to perform this function because of the otoconia,,or small crystals that are located within them. Gravity acts upon these crystals when the head changes position causing them to move in a certain direction and stimulate the nerves responsible for communicating with the brain. In this way, the nerves tell the brain whether the body is lying down or sitting up. As you may have guessed, the role of the semicircular canals is to determine movement of the head regardless of its position with respect to gravity. When the head accelerates, fluid moves through the semi-circular canals in each ear stimulating small hair cells. The movement of this fluid stimulates a nerve, which tells your brain your head is moving in a certain direction. When the system is acting normally, this is how the two different portions of the vestibular system work. BPPV arises when crystals become dislodged from the utricle and saccule and make their way into the semi-circular canals. The problem with these crystals being in the semicircular canals is now these canals become sensitive to gravity and they are supposed to act independently of gravity. Now any change in head position that causes gravity to act on these crystals also causes fluid movement through the canals and hair cell stimulation. This is especially problematic when the vestibular apparatus on one side of the body tells the brain the head is accelerating and the organ on the other side disagrees. Now your brain, which uses vestibular system information to control movement of the eyes doesn’t know what to tell your eyes. This results in nystagmus or a rapid twisting movement of the eyes making it appear like the room is spinning. So now that you understand the underlying cause of BPPV, you’re probably wondering how to fix it, or maybe you already guessed because the answer is obvious. We simply need to get the otoconia out of the semicircular canals! 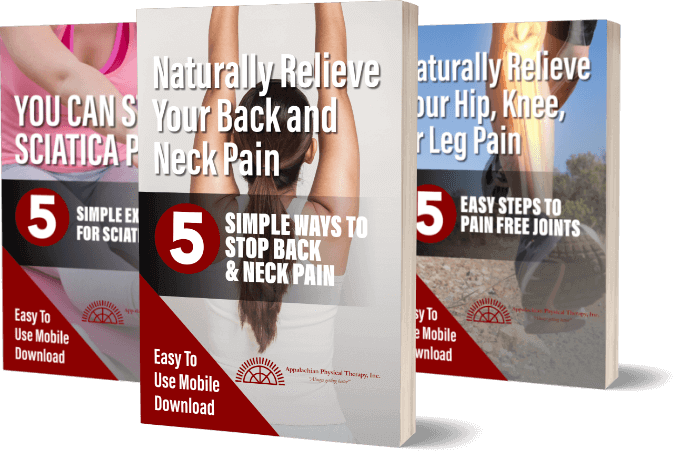 We can do this in a variety of ways but the most effective way is to receive treatment from a practitioner including a physical therapist with a good understanding of diagnosis of this condition. Once properly diagnosed the therapist can target the affected semi-circular canal by placing a patient’s body in a series of different positions. These positions use gravity to move the crystals through the canal until they are all the way out. The procedure if conducted correctly can generally resolve this condition in a few short visits. For more information on this condition, please see our conditions treated link here: https://www.aptfc.com/conditions-treated-by-appalachian-physical-therapy/.